KHOTANG, Feb 15: Despite their poor financial conditions, the locals of Khotehang Rural Municipality in the district had no option but to chart helicopters in case of medical emergencies. However, the district was provided with ambulances a few months ago. This to a great extent has benefited the locals as they can now save a large amount of money which would be otherwise spent on hiring helicopters in the past. Shyam Rai of Simpani, Khotehang Rural Municipality-8, was taken to BP Koirala Institute of Health and Sciences (BPKIHS), Dharan by an ambulance on Sunday after sudden backache. Had there been no ambulance at Simpani Primary Health Center, Rai, like others, would have to charter helicopters spending a large amount of money in the past. Earlier, those who could not afford to charter helicopters were compelled to struggle with their illness. Some even had to lose their lives. 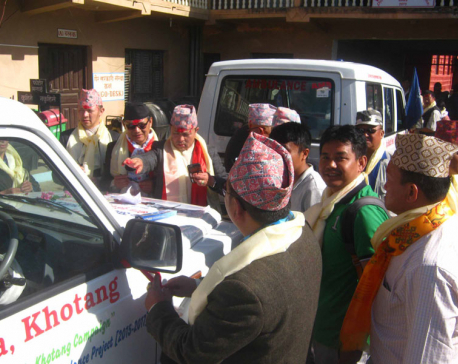 However, the situation changed after Khotang Service Society UK (KSSU) donated ambulances to the health centers. Before this, locals had to spend more than Rs 150,000 for chartering helicopters. As many as 65 patients have benefited by the ambulance service so far. They have been transported to Dharan, Biratnagar, and Kathmandu among other places, according to Deep Bahadur Thapa, chief of Ambulance Operation Committee (AOC). On April 5, 2017, seven ambulances were provided to Khotang by KSSU. "The ambulances have been a great boon for the patients with serious illnesses," said Thapa, adding, "This has reduced their financial burden." According to Debendra Shrestha of Chisapani, Jantedhunga Rural Municipality-5, the ambulance service has instilled the hope in the locals that their loved ones won't have to die, like in the past, after being unable to charter helicopters. "It takes 10 to 12 people to carry patients to hospitals on stretchers. The ambulance has not just reduced the financial cost but also the manpower required," said Shrestha. Due to the obligation of chartering helicopters to reach hospitals, Khotang was known as the district where locals must have at least Rs 200,000 below their pillows at any given time for survival. During the rainy season, helicopters were chartered for 5 to 7 times a day. But that has come to a sudden decline after ambulance services were started at different parts of the district. With the construction of a concrete bridge over the Dudhkoshi River at Jayaram, in the district, the ambulance service has been more effective. "Ambulances are replacing helicopters," said Thapa.